Covers on several drainage pipes along the sidewalk in front of 825 and 827 alter street are uncovered or broken and it is very dangerous for older people and dogs! THey are also uncovered across the street as well. I have put in numerous tickets for this to no avail. This business continually puts out tons of trash, this past week it was 10 or more black trash bags, well before trash day. Neighbors have called the business but it keeps happening. The intersection of 9th and Washington, the east side has tons of potholes. They need to be filled in. It will only get worse before any storm and plowing. It is very dangerous on the side walks. I have tripped a few times but my dog always seems to find the open drain and put his foot inside. It is dangerous and allows rats and other things to come up. It has to be capped. T here are at least 3 on Alter street. 800 block. the city should repair. Still open and there are about 5. dangerous when walking my dog and for children. This is a small street that is often forgotten about. PSCA is doing a Flashlight Parade tonight in that area to identify issues for reporting. We'll be sure to take a look at these and find out who the appropriate party is to fix them. Thanks! Wonderful because this street is often overlooked and it isn't really fair. We also have an electricity pole that has been leaning for years and Peco came out and put a support on it but it looks horrible and takes up sidewalk space. I thought it was temporary until they could come to fix it but it has been years now. Hundreds of pigeons on the wires on S. Juniper street constantly being fed. The street, sidewalk, patios are covered in pigeon poop. The situation is actually worsening. The alleyway is filthy from the pigeons. They continue to be fed. Everyday this car wash let's all of its soap and chemicals run over the sidewalk and puddle in the street. The sidewalk is always very slippery due to the constant soapy water. Strong chemical usage is also evident due to the erosion of the cement in the sidewalk. It is a shame that this continues on a very prominent corner on Broad street after being reported on seeclickfix several times. I agree it's an eyesore in the neighborhood and could be better maintained. It's not only an eyesore, this stuff ends up in our water! This is not only a zoning due to improper drainage for a car wash but also several other violations due to the safety hazard of the soap in the sidewalk. There are two abandon cars on the 800 block of Wharton st. Both are Station wagons. The first has been disabled for two years, yet has magically received inspection stickers. It is a Green Chevy Dart parked on the North side of the street (815 Wharton). 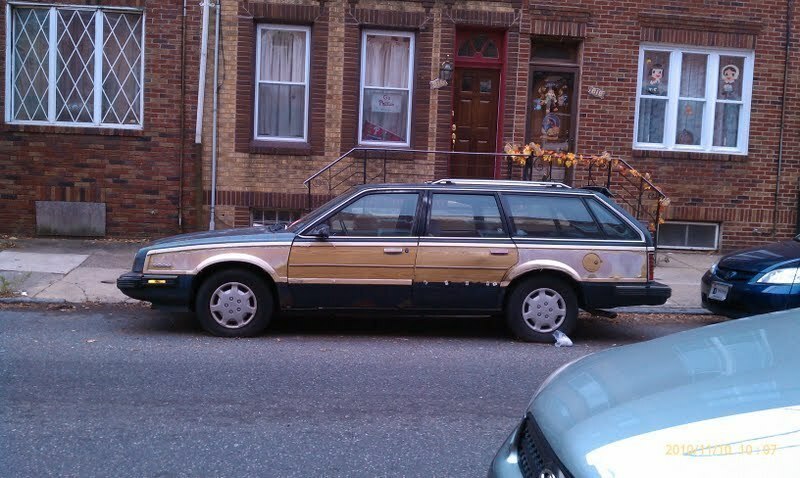 The second is a blue station wagon with wood paneling. It has been parked for there for 7 months. It broke down and the owner promised to have it towed, but never returned. The vehicles are large and take up two parking spots as well as attract garbage and rodents. A former corner store, this property has a huge spraypainted plywood or cardboard sign in the (filthy) front window advertising the store for rent. The sign has been there for years. The property is in general disrepair. There is a large glass and metal sign attached by an old metal pole to the outside of the building - could be in danger of falling because it has not been maintained. The city should inspect it and it has been reported to 311. Is there not some city ordinance that could require them to at least take the the hideous sign out of the front window? Cars parked on sidewalk and crosswalk. This is a very dangerous intersection for pedestrians. Cars should not be on sidewalk or crosswalk. Cannot pass with wheelchair or stroller, This is a constant problem. This is still happening every day.